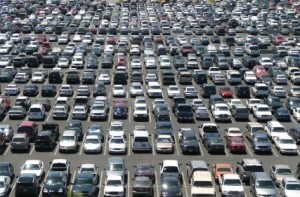 Parking lots, another huge concentration of Jackasses! There you are, in a full parking lot, desperately trying to find a space. You are not alone as other cars are following you throughout the lot. Maybe it’s even raining or snowing adding urgency and drama to the event. Then you think it’s your lucky day as you spy someone walking out to their car. You slow down hoping to grab their space. The person arrives at their car, you stop. A line of cars forms behind you as sit giddy with delight finally finding a space. Unfortunately you didn’t count on the driver being Jackass number 2 – the person who need 10 minutes (or more) to pull out their car out of a crowded parking lot. Again, it’s the always the freaking cell phone. These jackasses are usually talking and walking while getting into their cars. They are so important. Rather than end the call and address the business at hand they yammer away and try to one-handedly put in six months worth of Costco supplies. What a freakin’ Jackass. Finally thye pack their stuff and get in the car. You think they’re done. I guess you forgot you are dealing with a Jackass! They have to readjust their mirrors, recalibrate their stereos, get some gum, and who knows what else! By this time the car behind you is honking their horn to get around as a closer space has opened up. You are conflicted, should you take that new space or should you stay committed Jack’s space? Finally the Jackass vacates and you pull in only to be greeted by glares from the drivers who had to wait. This is the ultimate Jackass. They cause the problem, yet you get the blame. Please folks, if you are in a parking lot and it’s crowded – get in your car as quickly as possible and leave! That is of course unless you want to be a Jackass!